This night is all about relaxing and exploring shoes. Sample wines from LaBelle Winery and special libations from Djinn Spirits. 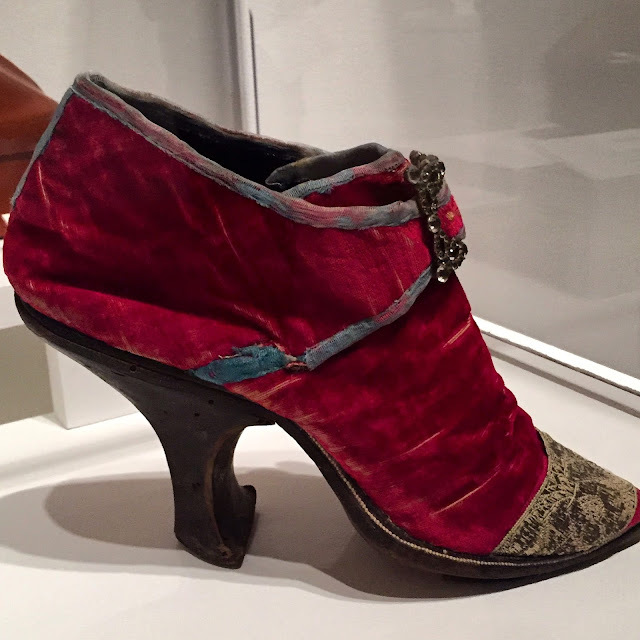 Learn the stories behind the world of shoes from Dr. Kimberly Alexander, UNH faculty member, and more. The evening will also include live music by MB Padfield, a cash bar and a tour of both Killer Heels and fashion accessories in art. 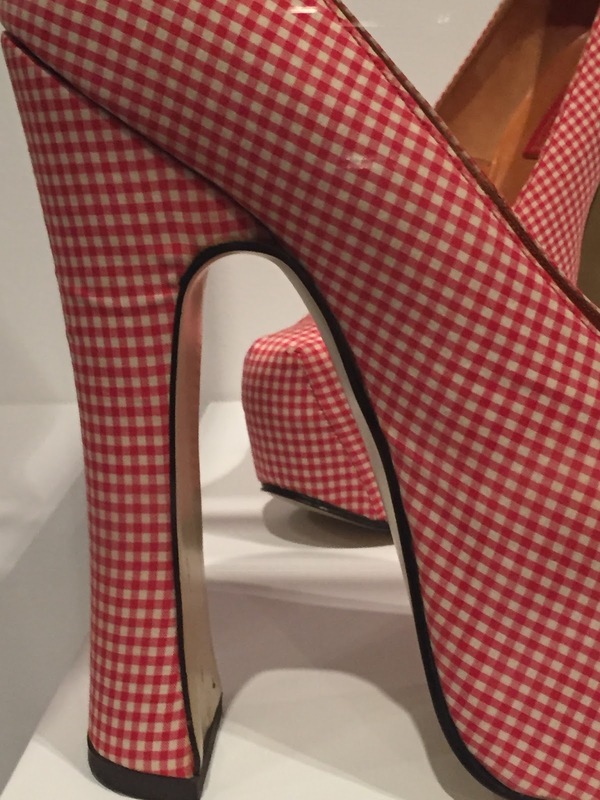 Free with Museum general admission, $8 special exhibition charge for Not-Yet Members to view Killer Heels. Ahhh – these elegant evening shoes, were made in Paris and worn by American Abigail Kinsley Norman Prince (1860-1949). As with many wealthy women of the time, she travelled to Paris, visiting the fashion houses and acquiring the latest in French fashions. 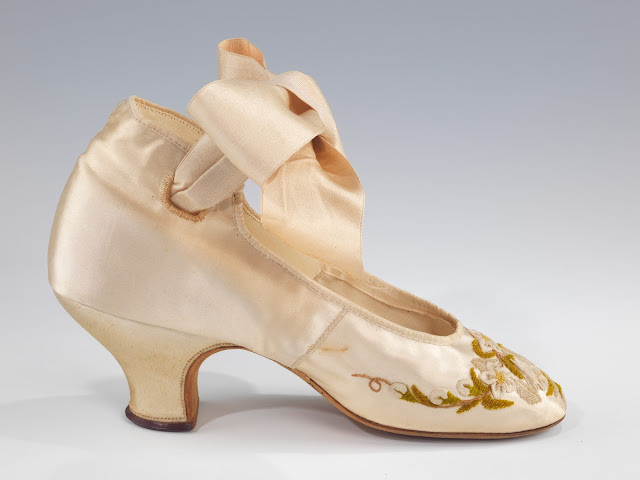 Mrs. Prince’s family donated the shoes to the Metropolitan Museum in the 1960s, along with a rich collection of some 400 garments and accessories. . There are several unusual elements found in the evening shoes, indicating not only a special make, but perhaps, Mrs. Prince made certain stylistic requests from the unknown designer. 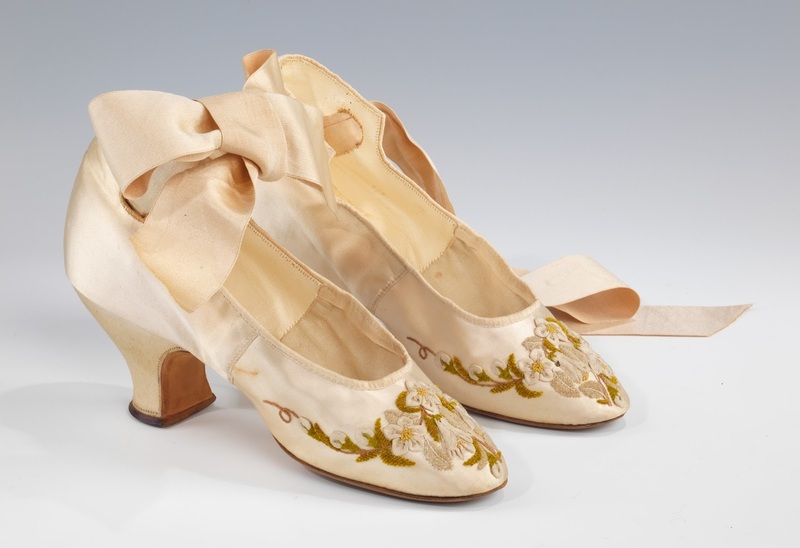 The evening shoes featured ribbon work embroidery, not commonly seen on shoes. Further, the oversized satin ankle straps were unusual for the time – generally shoes were slip-ons, without straps. These details most likely indicate a special order. The quality of the shoes may also be seen in the finished edges and the stitching on the heel and instep. "Life and Death in the Piscataqua Region"
and a lunch of homemade soup, bread and dessert. Elizabeth Aykroyd. “The HMS America: Building a Royal Navy Ship of the Line in Portsmouth,” on the story of this ship, a model of which was the first artifact acquired by the Portsmouth Athenaeum in 1820, and its connection to the New England expedition against Louisbourg in 1745 represents an important chapter in the history of mid-eighteenth century Portsmouth. Jeff Hopper and Sandra Rux, “Revealing the Warner House,” presenting new research in celebration of the 300th birthday of the Warner House. Peter Michaud “A National Register District for Portsmouth,” on the progress of the National Register nomination, and what it will mean for Portsmouth. Janet Polasky. “Undocumented Cosmopolitans in Revolutionary New England,” draws from Polasky’s research for her new book Revolutions without Borders: the Call to Liberty in the Atlantic World. The annual event, a fund-raiser for the Portsmouth Historic Sites Associates, will also include a preview of upcoming events for history lovers, a raffle, and sales tables including some from member sites: Historic New England; Moffatt-Ladd House and Garden, Portsmouth Historical Society (John Paul Jones House); Strawbery Banke; The Gundalow Company; USS Albacore Museum, Warner House, Wentworth Lear Association, and the Wentworth Coolidge Mansion. The Portsmouth Historic Sites Associates partners centuries-old historic homes and vessels, some of the most important in America. Within the architectural treasures, a multitude of rooms with authentic antique furnishings reveal poignant stories of home and work in a thriving seaport community, while the historic vessels detail chapters of Portsmouth’s history afloat. For more information go to: www.portsmouthhistorichouses.org, or visit us at Portsmouth Historic Houses on Facebook. For more information, or to reserve a space at this year’s event, call (603) 436-8221.